The career of the French saint Vincent de Paul has attracted the attention of hundreds of authors since his death in 1660, but the fate of his legacy - entrusted to the body of priests called the Congregation of the Mission (Lazarists) - remains vastly neglected. De Paul spent a lifetime working for the reform of the clergy and the evangelization of the rural poor. After his death, his ethos was universally lauded as one of the most important elements in the regeneration of the French church, but what happened to this ethos after he died? This book provides a thorough examination of the major activities of de Paul’s immediate followers. It begins by analysing the unique model of religious life designed by de Paul - a model created in contradistinction to more worldly clerical institutes, above all the Society of Jesus. Before he died, de Paul made very clear that fidelity to this model demanded that his disciples avoid the corridors of power. However, this book follows the subsequent departures from this command to demonstrate that the Congregation became one of the most powerful orders in France. The book includes a study of the termination of the little-known Madagascar mission, which was closed in 1671. This mission, replete with colonial scandal and mismanagement, revealed the terrible pressures on de Paul’s followers in the decade after his demise. The end of the mission occasioned the first major reassessment of the Congregation’s goals as a missionary institute, and involved abandoning some of the goals the founder had nourished. The rest of the book reveals how the Lazarists recovered from the setbacks of Madagascar, famously becoming parish priests of Louis XIV at Versailles in 1672. From then on, fealty to Louis XIV gradually trumped fidelity to de Paul. The book also investigates the darker side of the Congregation’s novel alliance with the monarch, by examining its treatment of Huguenot prisoners at Marseille later in the century, and its involvement with the slave trade in the Indian Ocean. This study is a wide-ranging investigation of the Lazarists’ activities in the French Empire, ultimately concluding that they eclipsed the Society of Jesus. Finally, it contributes new information to the literature on Louis XIV’s prickly relationship with religious agents that will surprise historians working in this area. "This volume engages a broad range of questions concerning the complex interaction of religious ideals and political and human realities in the era of Louis XIV and Louis XV. It merits a wide readership, including specialists in Jesuit history." "Although many books have been published about [Vincent de Paul's] life and his community’s significance as a dynamic force in Catholic-Reformation France, the history of the Congregation after his death is not often explored, and Smith’s book is a welcome addition." "This study makes an important contribution to our understanding of early modern religious organizations and their relationships with the absolutist state (as Smith points out, Vincent de Paul’s death corresponded almost exactly to the beginning of Louis XIV’s personal rule). The Lazarists have not received the same scholarly attention as groups like the Jesuits, even though their ideals and organizational structure were just as innovative and their influence as great." 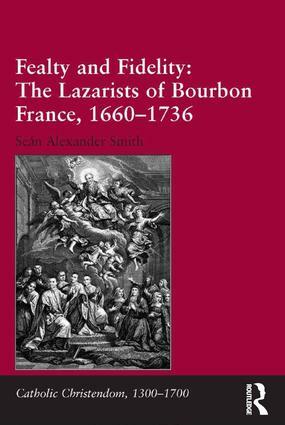 "It is a fascinating and highly readable account of the manner in which a religious community’s choices could become corrupted by closeness to power…Smith’s study is a valuable contribution to understanding the complex impact of absolutism on religious orders in early modern France." "…the book is an excellent piece of historical scholarship, and will be much appreciated by scholars of religious history." Introduction; In the footsteps of Monsieur Vincent: rhetoric and reality in the congregation of the mission; Fidelity and failure: the mission in Madagascar, 1648-1674; The call of the poor and the call of the prince: the Lazarists at court, 1672-1704; Masters and servants: the royal chaplaincies of the galleys, 1683-1703; Re-establishing Madagascar: piety and the ‘prince’s law’ in the Mascareignes, 1711-1736; Conclusion; Bibliography; Index. SeÃ¡n A. Smith completed degrees at Trinity College Dublin and the National University of Ireland, Galway. His new book project, Succeeding the Jesuits, will examine the handover of former Jesuit patrimony in the eighteenth century. In 2014, he received a Postdoctoral Fellowship with DePaul University in Chicago.